Global oil companies are plowing billions of dollars per year into solar and into energy storage, as more nations seek to switch their energy sources away from fossil fuels. In only 5 out of 15 acquisition deals done in solar over the past two years, over $8 billion was spent, according to an analysis by Mercom Capital Group. Similarly, out of 7 funding deals by oil companies over the past two years, more than $240 million was provided to solar companies, Mercom calculates. For battery storage investments, 6 acquisition deals were reported during the past two years, without values, Mercom says. During the same time period, 7 funding deals were done, involving nearly $133 million, Mercom says. 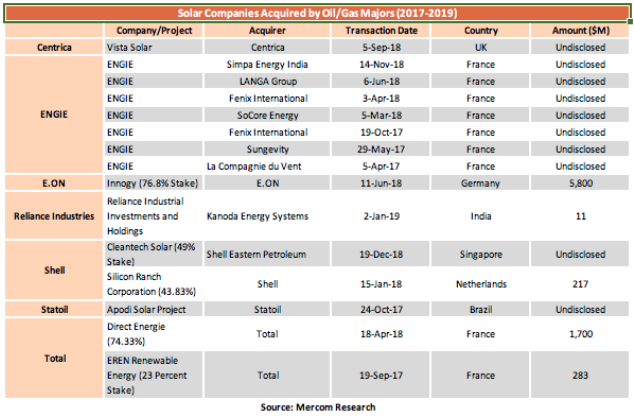 The largest of the oil investments into solar was by Germany’s E.on, with a $5.8 billion investment into Innogy, earning it a stake of 76.8% of the company in June 2018, Mercom shows. The next largest acquisition was by France’s Total, with a $1.7 billion investment in Direct Energie for a 74.3% stake. The value of the largest oil investment in battery storage was not disclosed, but is likely the acquisition by the Netherland’s Shell of Sonnen, earlier this month. The largest funding operation of a battery storage company was a loan of $70 million from Shell in May 2018 for Sonnen. Many more oil companies are in the solar and battery storage investment fray. 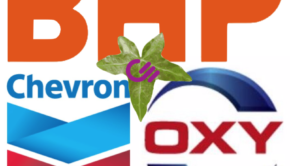 Royal Dutch Shell has acquired a 44% stake in solar developer Silicon Ranch for $217 million, Chevron has made investments in solar, BP spent $299 million for a 43% share of Lightsource’s combined 1.4 gigawatts portfolio of wind and solar, and Total Energy Ventures owns 56% of solar panel manufacturer SunPower, and has invested about $160 million in 20 renewable energy startups including solid-state lithium-ion batteries, according to the Motley Fool. Not all the oil company investments in solar win headlines. Earlier this month, Bakersfield-based oil producer E&B Natural Resources Management Corp. announced it is investing in photovoltaic solar energy to help power its operations in Kern and Santa Barbara counties. The company plans to build a 23 megawatt DC solar installation near Bakersfield. A 3 MW second installation will be constructed at E&B’s New Cuyama location, according to a company statement. “By integrating solar technology into E&B’s oil and gas operations, these projects demonstrate that renewable energy and oil production together can provide Californians with a reliable source of low-cost and environmentally friendly energy,” company President Steve Layton said in a statement. Some oil company investment is also upstream, in R&D. In Brazil, the national oil monopoly Petrobras has signed a partnership deal with Centro de Inovacoes CSEM Brazil to develop materials for the production of printed and flexible solar cells based on perovskite technology. The $6 million investment is aimed at the industrial production of solar films with perovskite technology.